The jury in the New York trial of Muslim cleric Mostafa Kamel Mostafa, better known as Abu Hamza al Masri, has convicted him of all 11 terror-related charges. Abu Hamza testified for four days in his defense. The jury did not believe him. His defense says the jury placed too much emphasis on the "terror camp that wasn't" in Bly, Oregon. James Ujaama, originally a follower of Abu Hamza, testified against him, as did another former ally turned informant, who testified via videotape from London. Ujaama also testified a few years ago at the trial of Oussama Kassir, a Swede who was also involved in the Oregon pseudo-camp. Kassir was convicted and got a life sentence. Jury selection began this morning in the trial of Mustafa Kamel Mustafa, aka Abu Hamza al-Masri. The 55-year-old Mustafa also will face a life sentence if he is convicted of conspiring to support al-Qaida by trying in 1999 to set up a terrorist training camp in Bly, Ore., by arranging for others to attend an al-Qaida training camp in Afghanistan and by ensuring there was satellite phone service for hostage-takers in Yemen in 1998 who abducted two American tourists and 14 others. Four hostages were killed. Cleric Abu Hamza, aka Mustafa Kamel Mustafa, aka Abu Hamza al-Masri, made his first court appearance in New York today, following his extradition yesterday from the UK. Manhattan U.S. Attorney Preet Bharara's press release is here. The 2006 Second Superseding Indictment is here. 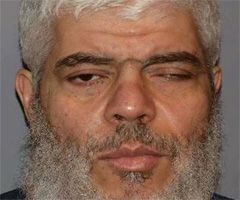 Along with Abu Hamza, four other alleged terrorists were flown to the U.S. Two will be tried in Connecticut, and three in New York. The other four are Khaled al-Fawwaz, Babar Ahmad, Adel Abdul Bary and Syed Talha Ahsan. In exchange for allowing the extradition, the U.K. obtained a promise from the U.S. that all five would be tried in civilian courts and not face the death penalty.